Mark "The Bird" Fidrych talked to the baseball. But the gangly Detroit Tigers pitcher spoke to fans in this state and captured the imagination of the nation thanks to his bizarre antics, happy-go-lucky spirit and dominating run as a rookie. Sunday marks the 40-year anniversary of Fidrych's first start, a complete-game, two-hit gem in a 2-1 win over the Cleveland Indians on May 15, 1976. Fidrych carried a no-hitter through six innings before Buddy Bell, who became the Tigers' manager 20 years later, got a hit to lead off the seventh. Fidrych struck out five and walked one that day, when he faced three batters over the minimum. "He really messes up your concentration," Bell said at the time about Fidrych's antics. "He's always talking to himself. ... All you could hear was, 'OK, ball, we're going to do this.'" Fidrych, a fidgety 6-foot-3, 175-pound right-hander from Massachusetts, was a 10th-round draft pick of the Tigers in 1974. He was basically an unknown commodity. During Fidrych's magical rookie season in 1976, the 21-year-old talked to himself, groomed the mound and soaked up a ton of attention while he fashioned a 19-9 record and major league-best 2.34 ERA. Fidrych was named AL Rookie of the Year after leading the American League in complete games (24) and he finished runner-up to Jim Palmer for the Cy Young Award. Fidrych hustled on and off the field, and generally he displayed sheer joy playing the game. He was one of few bright spots for the Tigers in 1976, as the team finished 13 games below .500. According to a Rolling Stone story, Fidrych drew more than 900,000 fans at ballparks in 1976. Fidrych was nicknamed "The Bird" in the minor leagues by a coach who said he reminded him of the Sesame Street character. A knee injury and, later, arm injuries derailed Fidrych's career, which spanned five seasons and resulted in a 29-19 record and 3.10 ERA. Fidrych died on April 13, 2009 at the age of 54 after an accident on his farm in Northborough, Mass. Note: Stats in this story come from baseball-reference.com. The quote from Buddy Bell is believed to have come from the work of the Detroit News' Dan Ewald in 1976, sourced from a 2014 Detroit Metro Times story by Dave Mesrey. Northborough – Boston’s Teamsters Local 25 awarded a $10,000 grant to Northborough’s famous “Fist Bump Kid” Liam Fitzgerald during its Autism Awards Reception held April 28 at the Strega Waterfront in Boston. The grant will be donated to Liam’s charity of choice– the Mark Fidrych Foundation. The foundation was formed in memory of Northborough resident and former Detroit Tigers pitcher Mark “The Bird” Fidrych. It is dedicated to supporting children and adults with disabilities and special needs with a focus on sports. Ann Fidrych and her daughter Jessica were in attendance to accept the donation. Ann said it was humbling and overwhelming that the Fitzgerald family chose the Fidrych Foundation as the recipient of the grant and that they were amazed at the generosity of the Teamsters Autism Fund. The Fidrych Foundation supports many programs and area challenger leagues including Northborough’s, which started in 2014. It gives boys and girls ages 5 to 18 with physical and developmental challenges the opportunity to participate in organized sports including baseball, basketball, soccer, and bowling. Liam, a third grader at Marion E. Zeh School, acquired the status of the “Fist Bump Kid” when a video of him fist-bumping Boston Bruin players as they came off the ice in before a November 2014 game went viral. That theme became the basis of his #BumpOutCancer campaign to raise awareness and funds for the Leukemia and Lymphoma Society (LLS). He received the honor of LLS Man of the Year 2015 after raising over $152,000. He was born with Down syndrome in 2006 and diagnosed with acute lymphoblastic leukemia in 2009. After undergoing four years of treatment, he is now cancer-free. Teamsters Local 25 awarded more than $350,000 to 10 area non-profit organizations during the event, which was primarily raised through their annual Autism Gala. During his LLS Man of the Year reign, Liam participated in and supported several fundraisers, made guest appearances, and broke the Guinness Book of World Records for most simultaneous fist bumps. His picture will soon be on an ice cream container to raise awareness for Special Olympics as the winner of the Spread the Lovin Award sponsored by Lovin Scoopful, an ice cream company that was started by Maria and Tim Shriver. The company donates 25 percent of its proceeds to the Special Olympics. The ice cream is due to be out in July. In addition, Liam has yet another honor coming his way – as one of the Massachusetts General Hospital Cancer Center’s one hundred 2016 honorees. Each year the center salutes individuals, groups and organizations from across the country and around the globe who make a difference in the fight against cancer in inspiring and often revolutionary ways, according to a release from the center. Liam will be honored at the center’s signature event on Tuesday, May 24. From Detroit Athletic CompanyA rare photo from 1978 shows Mark Fidrych with Alan Trammell in the background as The Bird warms up at Tiger Stadium. Mark Fidrych was a non-roster invitee to big league spring training camp by the Detroit Tigers in 1976. Maybe there’s a young pitching phenom at spring training in Lakeland with the Detroit Tigers this year. Maybe. But there’s never going to be another phenom like Mark Fidrych, who first ruffled his feathers as a young pitcher to watch forty years ago this month down in Florida with the Tigers during training camp in 1976. No one—not manager Ralph Houk, not pitching coach Fred Gladding, and certainly not fans of the club, starving for something to cheer about after a dismal season the year before—could have imagined that little-known Mark Fidrych would emerge from spring camp and earn a slot on the Tiger pitching staff. No one could have dreamed that the kid would grabbed a hold of the hearts of Tigers fans and become the most popular player in the game only a few months later. Synonymous by simply his moniker, “The Bird” Fidrych was known for his crazy antics on the mound during a five-year big league career that was cut short by injury. Sadly, little did the Tigers faithful or Fidrych himself know that his tremendously captivating ’76 American League Rookie of the Year campaign would be the highlight of his career. At the forefront of Fidrych’s ’76 season was his dominant complete game performance on June 28th, 1976, synonymous with the coming out party of “The Bird” on the national stage. In what was the eighth game of the season that he started and finished himself, he pitched on Monday Night Baseball in front of a large crowd at Tiger Stadium — 47,855 were said to be in attendance – and defeated the first-place New York Yankees, who would go on win two of the next three World Series titles, including finishing runner-up in the ’76 Fall Classic to Sparky Anderson and “The Big Red Machine” Reds. It was the singular moment in which Fidrych captivated the hearts of baseball fans not just locally but everywhere for the first time. Doug Wilson, the author of the well-renowned Fidrych biography “The Bird: The Life and Legacy of Mark Fidrych,” shares the sentiment. The antics he was known so well for throughout his career also were brought to center stage for the first time. He would often drop to his hands and knees to fix the pitcher’s mound, and was known to frequently jump around when he recorded an out. Refreshingly, “The Bird” didn’t simply create this image for himself to entertain the Tigers faithful plus the viewers at home who tuned-in for his starts. In fact, that was the way he had always been, according to Wilson. “He was 100% activity when he was a kid, and talking to a couple teachers he had, (they said) you couldn’t not like him” Wilson said. He was able to bring laughter into the classroom, which was an aspect of his personality that he carried on with him as he entered adulthood. Before all the antics of Fidrych were seen at the major league level, “The Bird” was already born. In fact, he was given the nickname by Jeff Hogan, a minor league coach at the time for the Bristol Tigers, where Fidrych spent his rookie ball days. At this point, “The Bird” had officially become the word, and Fidrych saw nothing wrong with such being the case. In fact, he embraced its usage. While the nickname didn’t add to any kind of fame for Fidrych in the minors, it meant all the difference for him at the major league level. As a 21-year-old and two years removed from being drafted by the Tigers in the 10th round of the 1974 amateur draft, it was a newfound fame that he had to deal with. It was a rise to fame that wasn’t expected for a guy like Fidrych, who was born in Worcester, Mass., not exactly a baseball hotbed, and raised in Northborough, Mass. According to Wilson, you could tell of his talent after two weeks in rookie ball, though. He was so good that he rose through the Tigers’ minor league system from the Single-A to Triple-A level in 1975, and won a championship that same season in Triple-A. He pitched to the tune of a 3.21 earned run average in 30 games — 22 of which were starts – and 171 innings, including a sub-two ERA (1.58) in six starts and 40 innings pitched with Detroit’s then-Triple-A affiliate Evansville. Despite all that noted success, he didn’t earn a start with the big league club the following season until May 15th, when he threw a complete game and allowed one run on two hits against the Cleveland Indians. He finished the season with 19 victories, a major league-leading 2.34 ERA and AL-leading 24 complete games as well as the most wins above replacement for a pitcher and any player in the majors (9.6). Subsequently, he not only earned Rookie of the Year honors but also finished runner-up for the AL Cy Young Award behind the Baltimore Orioles’ ace Jim Palmer. Despite tearing cartilage in his knee after “horsing around” while shagging fly balls during spring training of 1977, he seemed to be building on what he started in ’76 with a 1.83 ERA through eight starts in ‘77, earning another All-Star selection. This was the case until something went horribly wrong against the Orioles on the 4th of July. Sadly, for baseball fans all across the land, this is when the arm troubles that prematurely ended “The Bird’s” career first came to life. He only made it through five and two-thirds innings both against the O’s and in his next start against the Chicago White Sox, allowing six runs in both outings. His last start of the season came during his next time on the mound, when he failed to make it through one inning against the Toronto Blue Jays. Although Fidrych managed to record an ERA below three — 2.45 ERA — for a third consecutive season in 1978, it was only through three starts and 22 innings. With that said, the ’77 campaign marked the last time in which the one-time rookie phenom pitched in at least 10 games in a single season. Thus, it can be argued that July 4th, 1977 was the beginning of the end of Fidrych as we knew him. The arm trouble mounted in subsequent years, preventing him to return to the superb form he consistently had through the first 37 starts of his MLB career. He did, in fact, toy around in Detroit’s minor league system from 1978-81, with his last major league stint coming with the Tigers in 1980 after Jim Leyland—yes, the same Jim Leyland that managed the Tigers from 2006-13—helped him get back on track enough to return to the majors for a final shot at resurrecting his career. According to Wilson, Fidrych had a really close relationship with the former Detroit skipper, who played a significant role in getting him righted mentally in Evansville after his major league career had come to a halt and his struggles with Detroit’s then-Triple-A affiliate started to get the best of him. In fact, according to an article found in the August 12th, 1980 edition of the Lakeland Ledger titled “Fidrych is back, thanks to Leyland,” Leyland took him out for drinks after Fidrych failed to make it through the first inning of a game in Oklahoma City earlier that season. After doing so and talking about his performance, Fidrych went on to pitch four days later and allowed no runs on one hit in three innings. He followed up that performance by winning four of his last five games for Evansville before he found himself back in Motown pitching for the Tigers. In his first game back with the Tigers, he pitched eight innings and allowed three earned runs in a loss against the Red Sox. He pitched eight more games that season, marking the end of his MLB career. As Wilson noted, after returning to Evansville for 24 games during the 1981 campaign, he was given the opportunity to make it back to the bigs with the BoSox, who assigned him to pitch in Pawtucket in 1982. However, after two seasons with Boston’s Triple-A club in which he pitched 32 games and 171 and a third innings while never recording an ERA below 4.98, Fidrych called it quits. It wouldn’t be until two years later, in 1985, when he visited world-renowned pitching surgeon Dr. James Andrews, that he would find out he had torn his rotator cuff. It was too late for another comeback at the time, though. It was a sad fact of life for a guy whose career started with so much acclaim and promise. Fidrych passed away April 13, 2009 at the age of 54, in an accident while working on a dump truck in Northborough, about 35 miles west of Boston. He left behind a legacy that is still remembered and talked about to this day. It’s a legacy which starts with reflecting on memories of his rock star-esque rookie campaign of ’76, according to Wilson. Off the field, Fidrych was a personable man, who loved mingling with his fans. Additionally, after his playing days were over, he used his well-renowned moniker to raise money for charities. Rest in peace, Mr. Fidrych. Or should I say, “The Bird.” You’ll never be forgotten. Vito Chirco is a class of 2015 graduate of the University of Detroit Mercy, and a freelance writer for the Detroit Free Press. 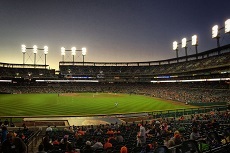 When the 22-year-old's not talking or writing about sports, he loves taking in a baseball game and watching his favorite professional sports team, the Detroit Tigers.